Danieli has struck a new partnership with GFG Alliance for the design and construction of a new high-tech rail and section mill at the Whyalla Steelworks. The new 750,000-tpy structural and rail heavy section mill will be an environmentally friendly facility that will increase the Steelworks production capacity, reduce waste and enable GFG’s Liberty Primary Steel to lift product capability and improve its competitive advantage. The mill will be equipped with the RH2 system, the Danieli patented process for rail hardening that enhances mechanical properties of high-speed rails through multi-immersion steps into a quenchant. The project will be executed in two phases. The first phase foresees Danieli to work in combination with AAR TEE Ferretti International for turnkey construction and auxiliaries, and the Liberty team to develop the engineering stage. The second phase will consist of equipment design, manufacturing, supplying and commissioning to reach the goal of hot commissioning in the following 18 months. The Australian government paid much attention to the project. 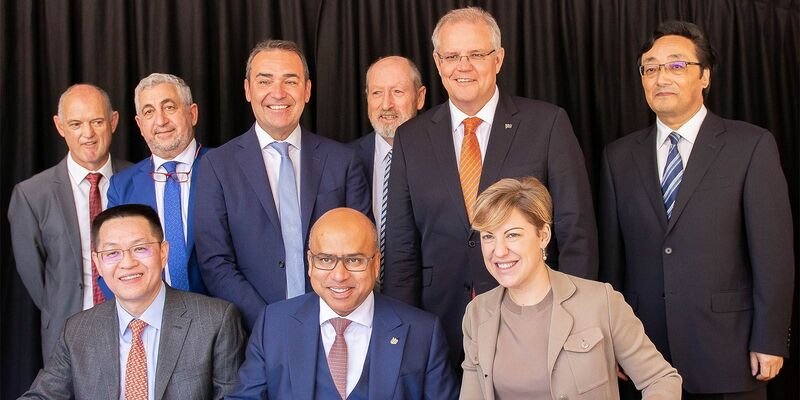 The Prime Minister of Australia Scott Morrison, the Federal Leader of the Opposition Bill Shorten, the South Australian Premier Steven Marshall, and the Mayor of Whyalla City Clare McLaughlin attended the signing ceremony.